You can place orders and also get instant quotes & proforma invoices from our MBRM WEB SERVICE (http://www.mbrm.com/asp/). After you log in, choose the main menu option: "Online quotes, proforma invoices and purchasing"
PLEASE NOTE: The price list below is per machine, not per application. Unlike most other vendors, we do not charge extra for allowing you to use the UNIVERSAL Add-ins in both Excel spreadsheets and from programming environments like Excel VBA, Access, Visual Basic, C/C++/C#, Fortran, etc. Since a user can have many applications and front-ends on one machine, our policy could provide considerable long term savings. Since we have one common dynamic link library for all Windows front ends, it seems logical for us the charge one all-encompassing (low) fee to cover all these front ends. Also, as part of our support contract you get a FREE license for your home computer (as long as the office and home machines are not used at the same time). PRICE LIST for 32-bit Client Edition Licenses for Windows. (For Server and UNIX Licenses, please contact our Sales Team for a quote) PRICE LIST for 64-bit Client Edition Licenses for Windows. Universal Add-ins: UNIVOPT, UNIVEXOT, UNIVINT, UNIVYLD (saving over £ 3,900). Universal Add-ins: UNIVOPT, UNIVEXOT, UNIVINT, UNIVYLD (saving over £ 7,900). Inclusive package of the above software packages. Free telephone, fax and E-mail support for high-speed query analysis. Free upgrades to the latest version of our Add-ins at any time. Free license for your home computer (as long as the office and home machines are not used at the same time). 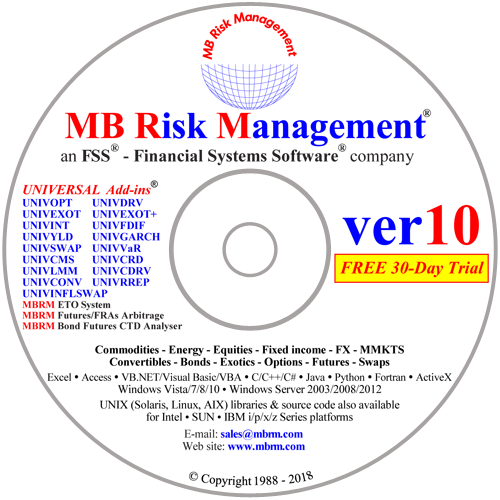 Access to the MBRM Web Service for license administration, support forums, instant quotes, etc. Therefore the support contract will save you TIME and MONEY in both the short and long term. Users must maintain a valid Support/Maintenance Contract in order to use the software. NOTES: [a] Regulated institutions are automatically pre-approved for 30 days credit terms - without needing to pay by credit card. [b] All orders are invoiced in Pounds Sterling (£). Any locally applicable VAT / sales tax / customs duty will be added at the current rate. [c] Postage to be added: £ 5 for UK and £ 27 for non UK orders (single charge irrespective of number of units ordered). No charge for postage if electronic delivery. [d] Support / Maintenance Contract can be cancelled at a renewal date by giving 30 days advance notice. [f] Prices subject to change without notice. [g] Errors and Omissions Exempted (EOE).